The upcoming Rosemont Five Star Hotel & Residences in Dubai will feature the Middle East’s first rainforest. Sporting 450 hotel rooms and 280 residential suites, the hotel also boasts a manmade beach, aquarium, infinity pool and trampoline park. But those aren’t the only factors separating this hotel from the rest. When you’re being dropped off at the hotel, you’ll have 4D animations on the ceilings which change theme every week or every night. 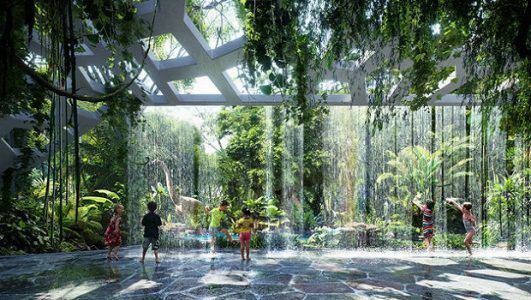 The hotel’s rainforest will be open air, located above the hotel’s entertainment floor, and will feature dense trees, canopies, some sun coming through, and during the summertime recycled condensation from the towers will create mist coming down from the trees to cool down the air. The rainforest will be open to hotel guests, residents and outside visitors alike. Tickets will be available to the general public, should passersby want to take advantage of a cool rainforest during the hot Dubai summer. The Rosemont is already under construction and scheduled to be finished by the end of 2018. To read more at The Huffington Post, click here.